Southern Utah University’s Michael O. Leavitt Center for Politics and Public Service (Leavitt Center) and the Utah Debate Commission will host the Utah Senate Debate on Tuesday, October 9. The debate is between Mitt Romney (R) and Jenny Wilson (D). 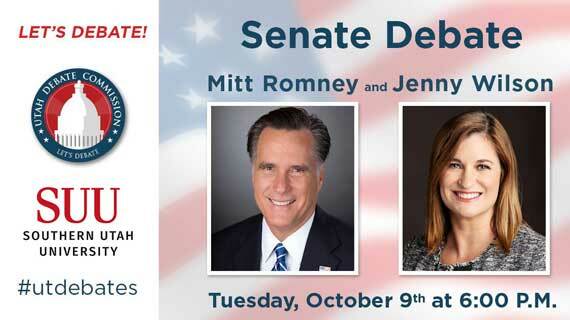 The debate starts at 6:00 PM in the America First Event Center on the campus of SUU. Tickets reserved via the Utah Debate Commission website can be picked up at the event one hour prior to the start. Audience members should be in their seats by 5:45 PM. No bags will be allowed in the venue. The public can submit questions for the debate on the commission’s website. The Senate Debate will air live on channels 5 (KSL), 2 (KUTV), 4 (Good4Utah), 13 (Fox13), and 7 (KUED). KSL Newsradio (102.7FM) and Utah Public Radio stations will also carry it live. Media partners will carry live streams on their webpages and the Utah Debate Commission will stream it via Facebook Live. Contact Nena Slighting, executive director of the Utah Debate Commission, for debate questions (nenas@utahdebatecommission.org). The Leavitt Center is an interdisciplinary hub for leadership opportunities, experiential learning, citizenship education, humanitarian service, and public policy research. This non-partisan center works to disseminate political information and spark debate about the ever-changing work of politics and issues that have an impact on the people of Utah and our nation.